I cannot profess that I am a great baker. Some people believe that cooking and baking are one and the same but they are completely different. Cooking is like painting or music. It involves engaging all the senses to know when you’ve done it right. You just throw in a bit of this and bit of that and when it smells just so, you know it’s going to taste good. Baking however is a science that requires the level of meticulous patience that I, quite frankly, do not possess in great quantities. Exact measurements calibrated to create this reaction or that gas which is the catalyst for light airy bread or tasty cakes. Unless you have a degree in chemistry it’s nearly impossible to know if you can substitute this for that. God forbid you use bread flour instead of cake flour because the differing levels of gluten may cause the consistency to …you get what I’m saying. This being said, I have historically been unable to create tasty treats. I have succeeded in making the worst cookies ever made in the history of baking. I don’t know what went wrong. I was attempting molasses cookies which everyone says should be simple but they’re not. I made the dough in a haze of flour and popped the tray in the oven. They came out in the guise of a tasty cookie. Chest puffed up at my accomplishment, I took a bite. You know that face that people get when they smell something bad? You’ve seen it or done it. It’s when all the features scrunch up to the center of their face and lips poke out. It may involve a confused shaking of the head. I discovered that this is the same face you get when you eat a bad cookie. As I was about to pour the batter into the disposal, Mike walked in. He asked what I was doing. Looking like a kid caught, I explained that the cookies were not fit for human consumption – I had to throw them away. My husband, the wonderful man that he is, explained to me “Babe, you don’t make anything that doesn’t taste good. Let me taste them.” I warned him that they were really actually bad but he insisted. He took his bite and I could see the chewing slow to near stop and his features pinched into bad cookie face. He swallowed hard, coughed and then said words that I will never forget “Babe, cookies are supposed to make you happy and these make me very very sad.” It’s been about seven years since then and I didn’t bake again until about 6 months ago. If my husband who will eat any concoction that I put in front of him can say this, we definitely have a problem. Plus I just don’t want to bring cookie sadness into the world. I think with age you gain patience and with patience you can learn how to bake. So recently, I began tackling my baking-phobia. I’m actually pretty good now and I’ve mastered cookies. Now my cookies make everyone very very happy. 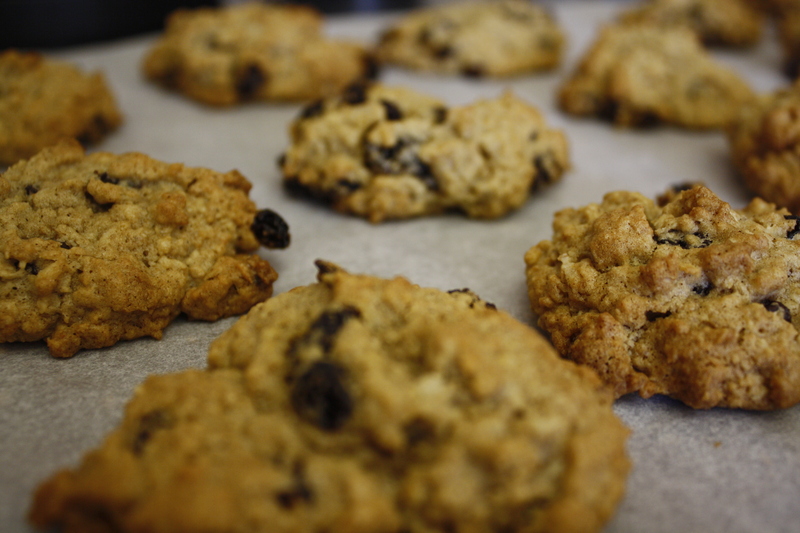 This recipe for oatmeal cookies is my favorite. It’s spicy, sweet, super easy and quick. 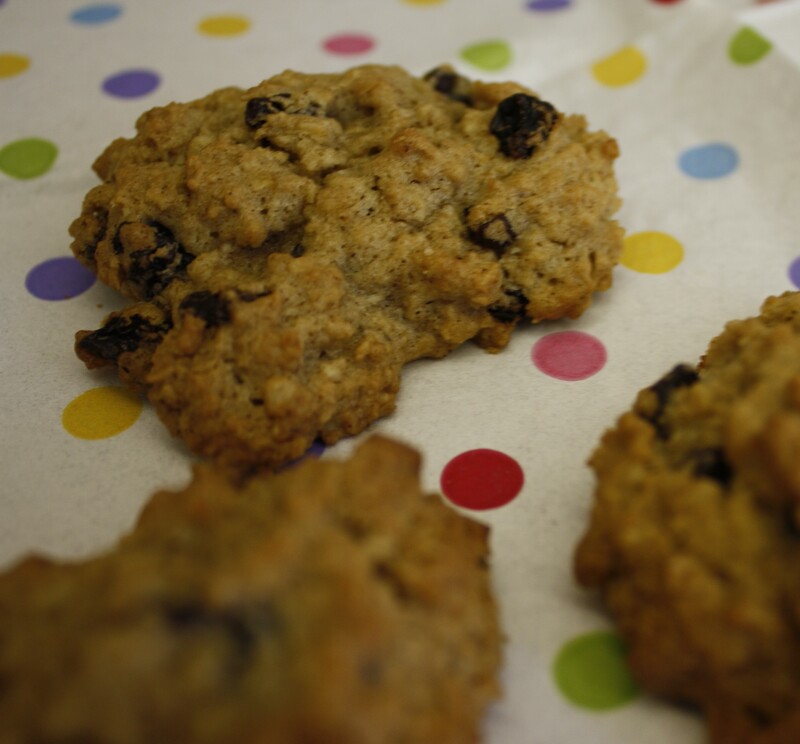 Plus oatmeal and raisins make you feel a little less guilty when you eat half-dozen in one sitting. 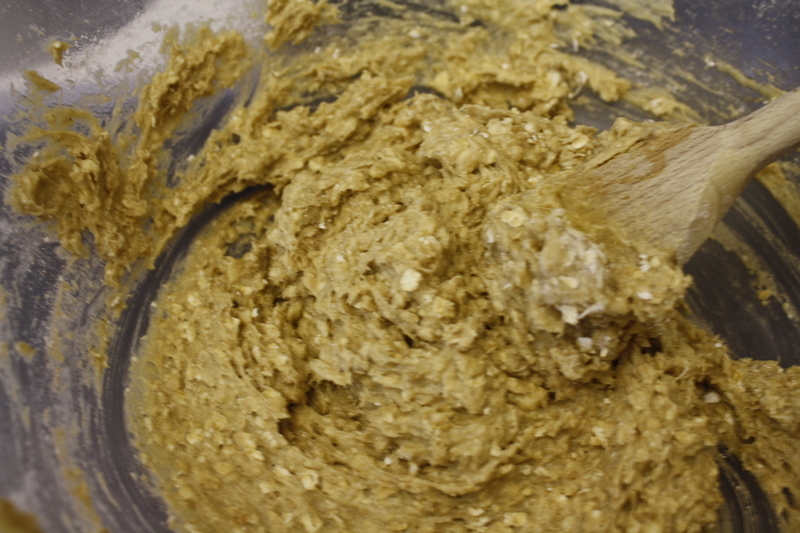 In a bowl combine dry ingredients (all ingredients in list from flour through and including rolled oats). Remember when measuring ingredients in measuring cups the contents should over-fill the cup and the excess should be scraped off with the flat side of a butter knife. 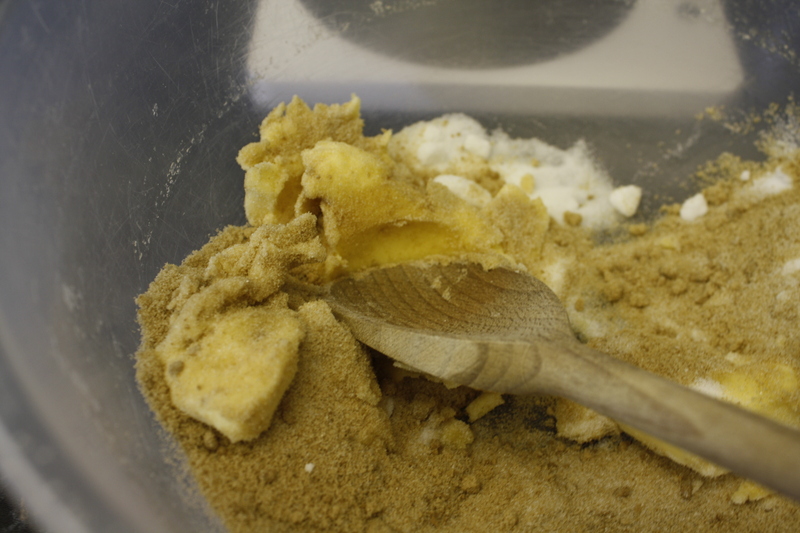 In a different bowl, mix butter, shortening and both types of sugar. The easiest way to mix these is to spoon sugar over butter press the back of the spoon into the mix until the sugar is pressed in, stir and repeat until all sugar is incorporated into the butter. Add the egg and vanilla into the batter and mix until it is smooth and creamy. Now add ¼ of the flour mixture. 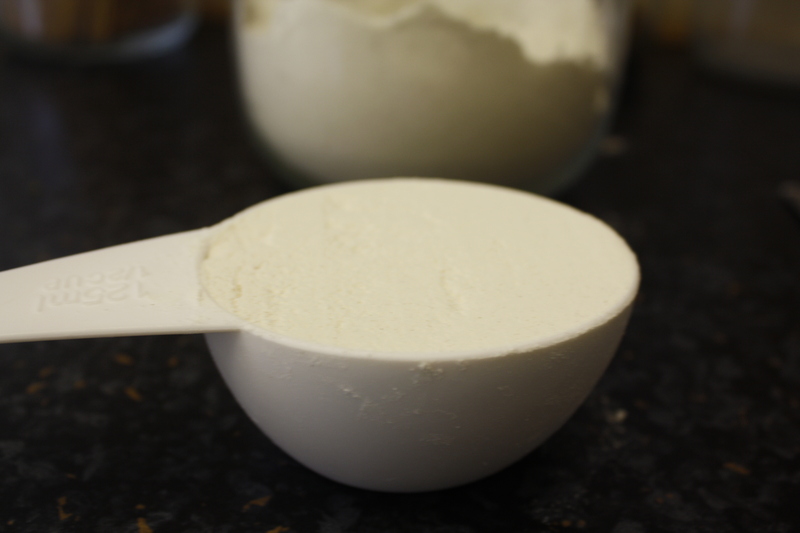 Mix this into the batter until no flour is in the bowl. 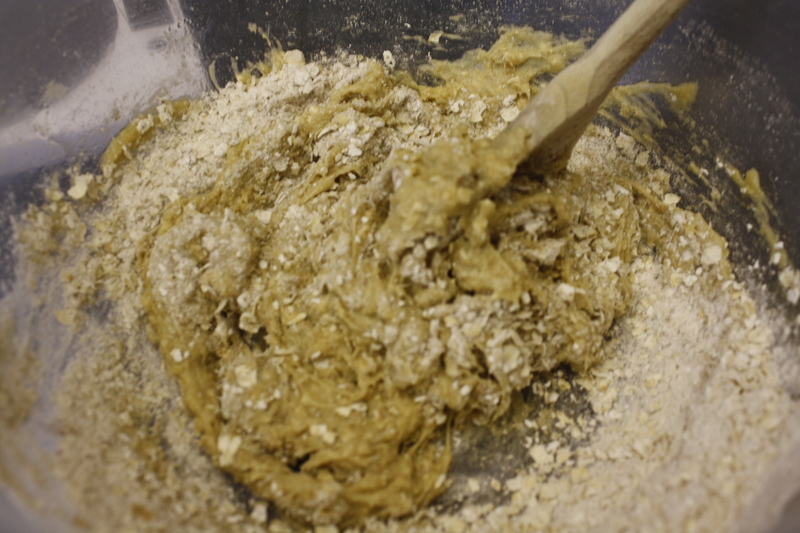 Repeat this process until all the flour mix is added to the batter. The last time you do this it’s going to be a bit tough getting it all incorporated but I swear it really will all get in there just keep at it. The press and stir method that was used to mix the sugar into the butter will also work here. Add in currants or raisins. 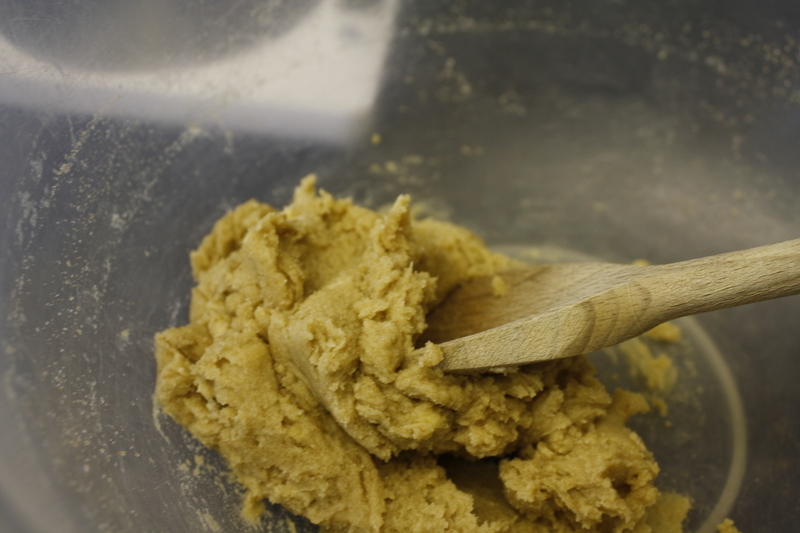 Using one of the cutlery spoons, scoop out a ball of dough. Using the other spoon, push the ball onto the cookie sheet. The balls should be about 2 inches apart on the cookie sheet. Place in the oven and bake for 12 minutes. Keep an eye on the first batch because the cooking time may be longer or shorter. 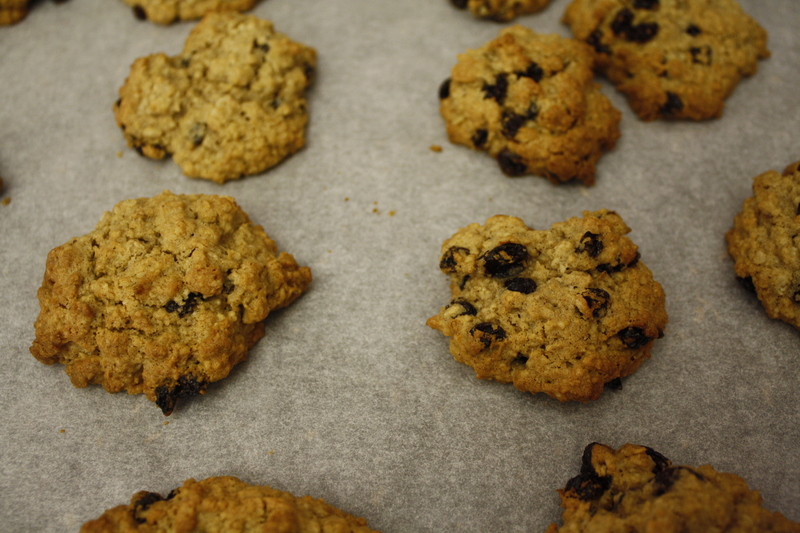 The cookies are done when the tops no longer look wet and the edges are crispy. Place a sheet of wax paper or aluminum foil on the kitchen counter. Remove the cookies from the oven and leave them on the cookie sheet for 1 minute to cool. 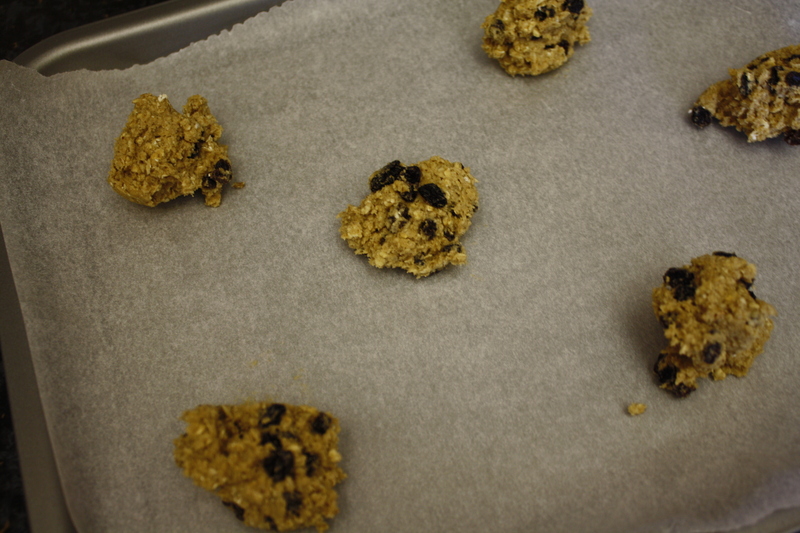 Then with a spatula, remove the cookies and place them on the wax paper to cool the rest of the way. This will make the cookies extra soft and chewy. If you have more dough, repeat the baking process but note if the cooking time was different and reset the time to the correct time for your oven. Oh, honey. I’m sitting here laughing. Your writing is so good. You can picture the event as it is happening. Of course, I’m just Mom. It’s certainly refreshing to know that great cooks like you make sad-tasting items. The difference is that we non-bakers don’t keep trying until we get them to make someone happy!